Homer's Travels: The Christmas Season Has Begun Again. The Christmas Season Has Begun Again. 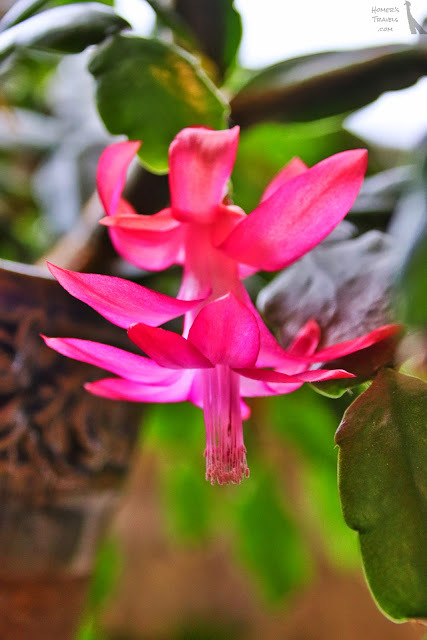 While, for me, the holiday season starts with Thanksgiving, the season of Christmas starts with the blooming of my Christmas Cactus. Today, a bud that I have been following for the last week, bloomed. First bloom of the 2018 Christmas season. This plant is a descendant of the Wife's Great-Great-Grandmother's cactus. It is quite possible that this plant, and all the clippings I have gifted to other family members, continue a line that is over one hundred years old. Christmas is finally here and all is good with the world. Book: John Scalzi's "The Collapsing Empire"
Book: Jy Yang's "The Black Tides Of Heaven"
Book: Victor Lavalle's "The Ballad Of Black Tom"